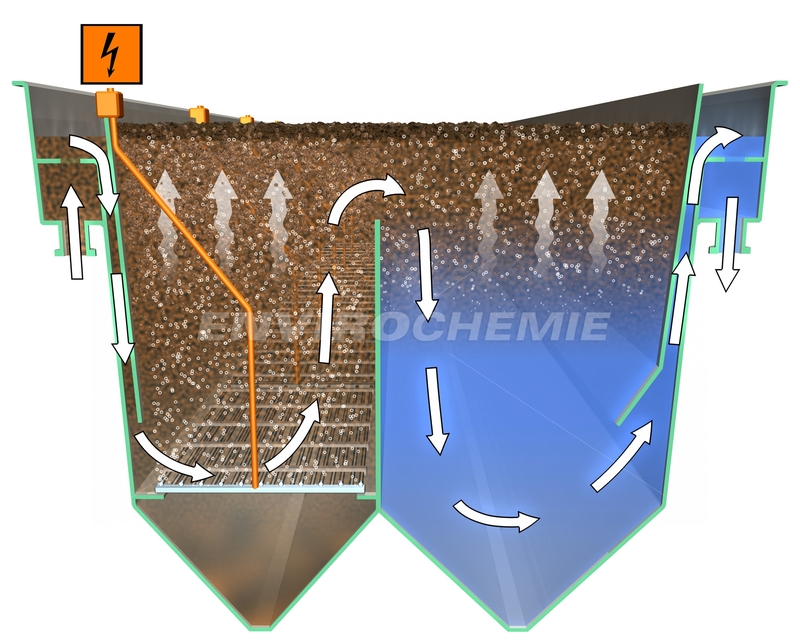 Electroflotation according to the Dr. Baer system is particularly suitable for removing oily substances, such as those generated in rolling mills, or for the removal of dispersions that contain particles and fibres, which for example occur in the production of glass fibre and other non-woven fabrics. While investment costs for electroflotation are always higher compared to dissolved-air flotation, it can be used without any restrictions for water temperatures in excess of 80 °C, and barely creates any foam. The precise separation of the flotate ensures a high degree of cleansing, eliminating the need for further filter stages. This makes electroflotation especially suitable for the cleaning and treatment of water circulation systems. Process principle of the E-Flo-Dr. Baer electroflotation plant. Minute bubbles of gas are generated at the electrodes and ensure an almost laminar flow in the reactor.